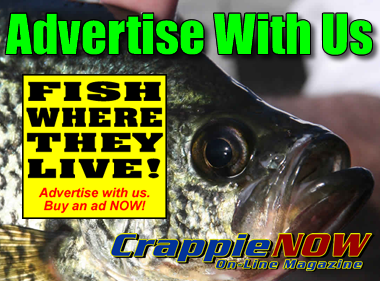 The best pockets for slab white crappie often are deep within thickets or beds of dense aquatic vegetation. Pulling a small boat beyond the edge allows fishing these seldom-touched honeyholes. The button willows we were fishing were thick enough to hide a hunter-orange hippo. But on the edge in open water, another fisherman somehow managed to see us. “Hey! Y’all need some help?” he called. “Thanks for asking, but we’re fine,” replied my companion Lewis Peeler. Peering through the tangles, I could see the puzzled look on the man’s face. He shrugged his shoulders and continued fishing down the edge. Had we told him we were fishing, he surely would have thought we were crazy. Lewis returned to the business at hand, maneuvering a jig over a small pocket of open water beside a log in the brush. He carefully guided his pole through the maze of cover, then lowered the lure into the pocket. Instantly, the pole bent downward. Pulling it quickly to his rod tip, Lewis managed to pluck a fat white crappie from the gnarly bushes. Fact is, Lewis and I often act like pickpockets. Years of on-the-water experience have shown us that crappie—especially big white crappie—love isolated, seldom-fished pockets of water. 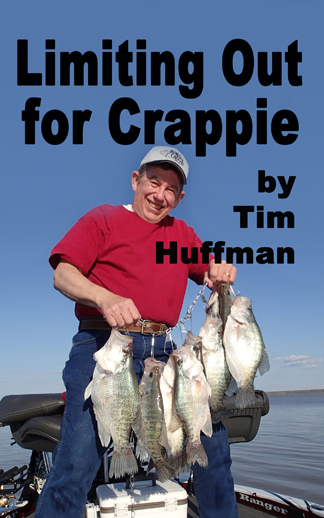 Pockets provide crappie a sense of security unavailable in water that gets fished by every passing boat. If you can find these hidden honeyholes and drop in a jig or minnow, you’ll catch some slabs. The best pockets are those within big thickets of dense cover. Size isn’t important. The pocket may be no bigger than the top of a garden pail or as large as a school bus. The key factor is placement. The opening should be in the thicket’s interior, away from the edge, where crappie go to avoid anglers fishing the perimeter. 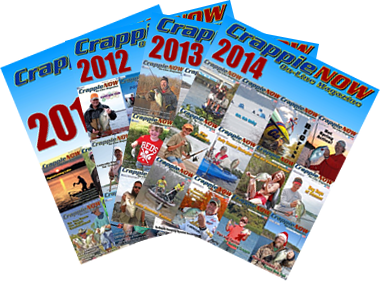 The best pockets encompass cover or structure features likely to attract white crappie: a log or stump, a creek-channel edge or standing snags. Any structure different from the norm is likely to attract some keepers. Big boats won’t reach many pockets, so I prefer fishing from a light, narrow, 12-foot aluminum johnboat outfitted with a small outboard, no trolling motor and a minimum of fishing tackle. You don’t want heavy gear holding you back. To penetrate thickets and reach pockets, you must grab limbs and pull your way through until you can reach the spot you want to fish. Casting is impossible, so use a long jigging pole for extra reach. You also need fairly heavy line—15-pound-test works good—so you can bring fish quickly into the boat. Many anglers prefer minnows for enticing white crappie, but lively bait will hang you up. Jigs, on the other hand, are ideal for fishing tiny pockets in mazes of interlocking brush and timber. Begin by grabbing your line just below the line-guide eye nearest your reel or line holder. Then pull your jig tight against the eye on your rod tip and carefully work the pole through the tangles until your jig is over the pocket you want to fish. If the hole is closer than your pole is long, you may have to grasp the pole, and your line, near the middle instead of on the end, leaving part of the pole sticking out behind you. Continue holding the line tight, with the jig against the rod tip. Now, let the jig down slowly so it drops into the pocket. Some anglers jig their jigs—up, down, up, down. But this isn’t necessary, and such action could cause unnecessary hang-ups. Lower the jig to the desired depth and hold it stationary. Vibrations relayed through your pole to the lure impart enough action to attract crappie. When a fish hits, reverse the action. Keep the line in your hand, set the hook, pull the fish up to the rod tip, then back your rod up to boat the fish. There still will be occasions you’ll get tangled or lose fish, but using this technique will keep hang-ups and escapes to a minimum. Beds of submergent vegetation such as elodea and coontail often are overlooked as crappie concentrators, but pockets in underwater weedbeds may provide outstanding crappie action. Green weedbeds provide protection, oxygen and shade. Baitfish and other forage animals are attracted to this comfortable environment, and crappie follow. Once again, the biggest fish tend to hold in hard-to-reach pockets seldom fished. Because submergent vegetation grows best in clear waters, you typically can find underwater pockets simply by looking for them. Wear polarized sunglasses to cut glare, and as you drift over a weedbed, watch for openings in the vegetation. Here again, the best pockets encompass features of structure or cover that don’t conform to the norm. Timber stick-ups frequently hold fish, as may open cuts through the vegetation and nearby points or humps. Consider fishing these pockets with a Charlie Brewer Weedless Crappie Slider. When properly rigged, with the hook point of the special-made jighead buried in the grub, the Slider does exactly what Charlie Brewer intended it to do; it eliminates the aggravation of constant hang-ups in dense cover. Some anglers simply cast into pockets and slowly retrieve the lure across the bottom. A better way is to rig the Slider beneath a slip bobber, which allows changing depth so the lure hangs near the top of weed edges, at mid-depths or in dark corners near the bottom as conditions dictate. The rig is retrieved in a jerk-stop fashion, pulling with a hard tug so the Slider rises toward the surface, then stopping long enough to allow the lure to sink perpendicular to the surface again. 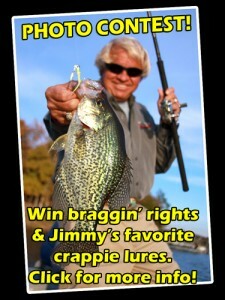 This process is repeated until the lure has been retrieved from one edge of the pocket to the other, or until the angler feels the tell-tale tap that reveals a striking crappie. Fishing pockets in hard-to-reach cover is a superb way to increase your success when targeting big white crappie. Don’t get the wrong idea, though. Picking pockets isn’t a lark. Fishing heavy cover successfully requires hard work and patience. Look at it this way, though. When fishing is slow, you can take the easy way out and go home empty-handed, or you can work a little harder and catch some real nice crappie. What’s it gonna be?